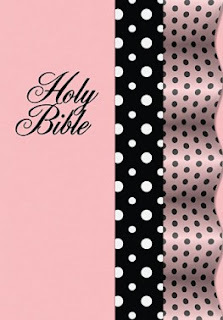 Perfect for Girls and Tweens, this is a full text International Children's Bible. This Bible is so sweet and perfect size for young girls to carry to church and Sunday school! *Why should I read the Bible? Hardcover Bible comes in a gift giving box for your special little girl! If I got to design a bible cover mine would be a knitters design maybe pink lol. I know I am silly but thats what I would like. If I could design a Bible cover, it would be lavendar with rainbow in the center. Below the rainbow would be Isaiah 41:10 in Bold letter...one of my favorite verses! I would do a blue sky cover with soft white clouds.